The Hills of Arran is the title track of my next album, due for release on December 5th with a launch event at CB2 in Cambridge that evening. We needed a photo shoot for the cover and some film for the video. We had never been to Arran, and it came with high recommendations, especially from my grandparents. All good reasons to visit the island that is described as ‘Scotland in miniature’. 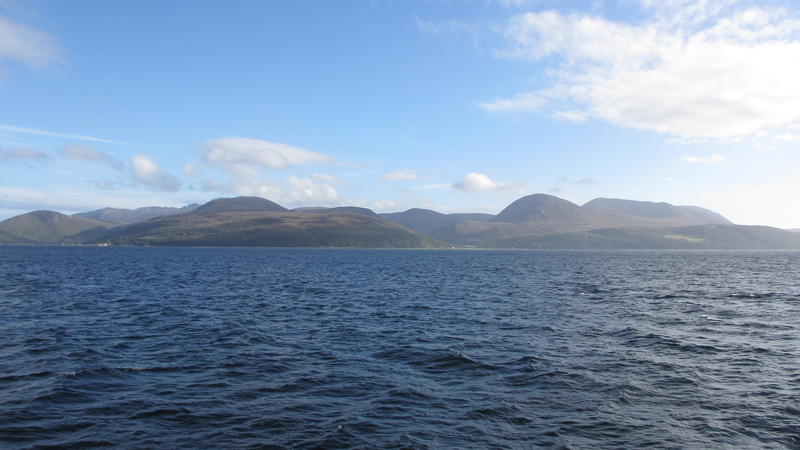 Our ferry had brought us into Lochranza the day before, and we had stayed just outside Blackwaterfoot on the western coast. The weather forecast for our first full day was poor, so we decided on a valley walk up Glenrosa rather than risking rain and strong winds on the hills. In the event the rain held off for the morning and we rambled up a classic glacial valley with Goatfell, Arran’s highest peak, on our right. 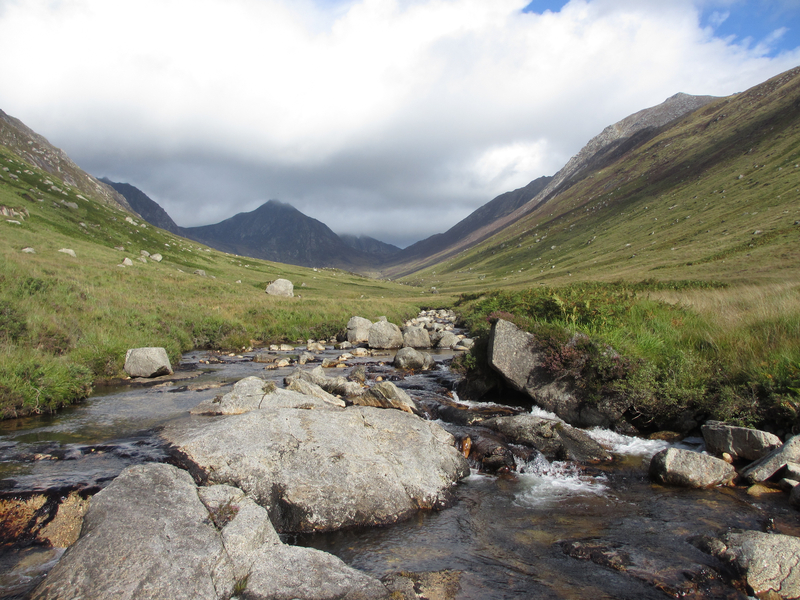 Half way up the valley, the first of two remarkable encounters with wild Arran took place. Two golden eagles soared into view and one came quite close to us as three buzzards also appeared. For a while they soared just under Goatfell together, and then suddenly the eagle tumbled earthwards and seized one of the buzzards by the talons. The buzzard managed to fly off a couple of times but each time the eagle went for it again. The two went to ground and as neither bird flew off again we could only assume that a young and very inexperienced buzzard had become the eagle’s lunch. After our own rather more vegetarian picnic the rain began, the hills did indeed ‘hang behind the lasting water’ and we turned back, well wet by the time we reached the car, but satisfied to be back in the Scottish hills. That evening we watched the rain pile in across Kilbrannan Sound from Kintyre. The next day we walked along the beach out towards Drumadoon Point, scattering oystercatchers as yet more showers built over the mainland. 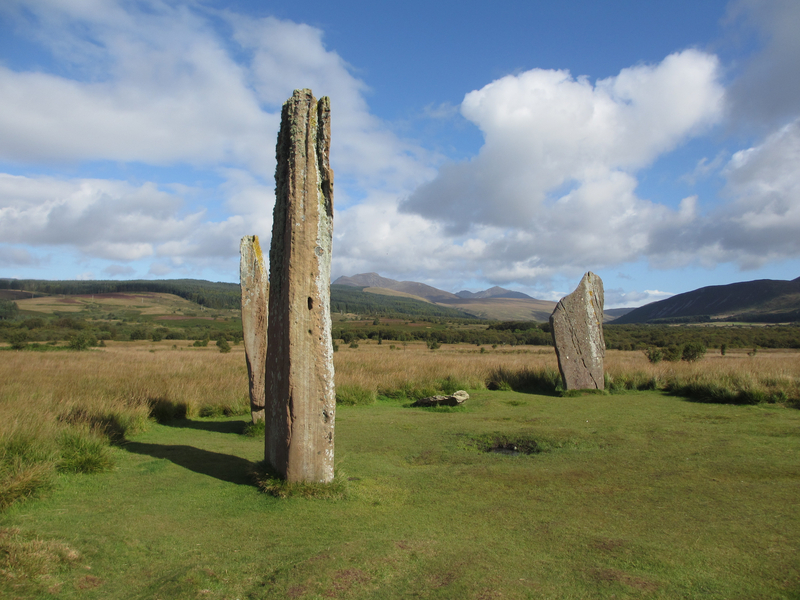 We continued on to the remarkable stone circles of Machrie Moor – Stonehenge without the crowds, the fences or the A303 and all the more magical for that. For our final day the weather at last settled down a little. 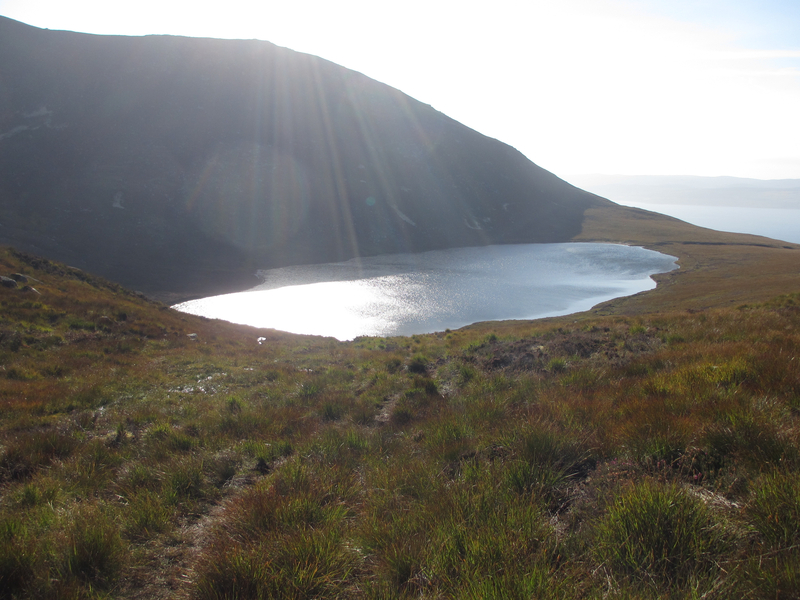 We set off from Thundergay up the hillside towards the delightful Coire Fhionn Lochan. About half way to the lochan a group of red deer hinds were silhouetted against the distant Sound of Bute. Clouds still hung around the hilltops as we reached the lake, and it would be some time before the sun timidly appeared. Inspired, we set off up the steep slope of Meall Biorach, reaching the first summit just as the mist rolled away from the surrounding hills. 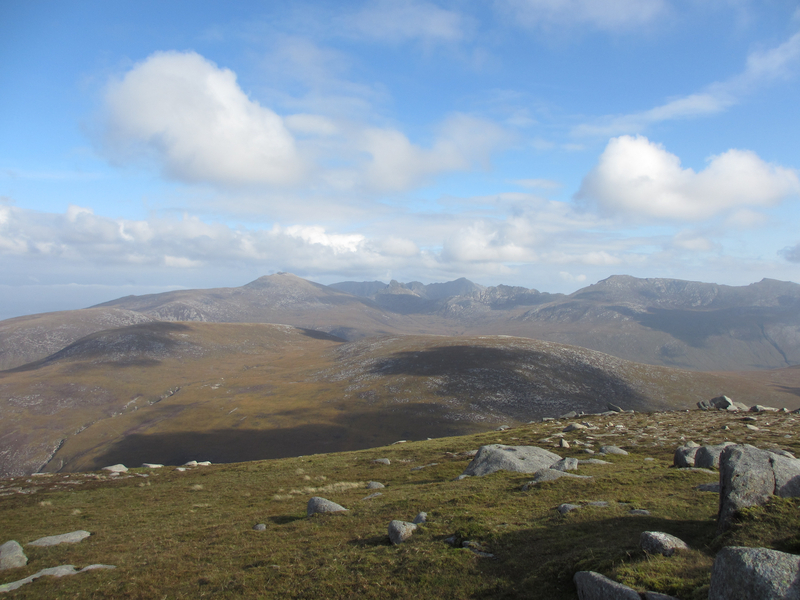 As the sun steadily grew in strength, we carried on up Meall Donn, to be treated to magnificent views across the Arran hills and the surrounding mainland. An eagle flew past us, hugging the ground as it reached a nearby pass before descending into Glen Catacol towards Loch Tanna. Heading down towards the other side of the lake we heard a red deer stag roaring and watched as his herd moved up the hill opposite. The early evening light showed the lochan in its full glory. We were taking a short break walking back down from the lochan when our second remarkable encounter with wild Arran took place. A young meadow pipit flew under our legs and a moment later there was a rush of wind as a female merlin aborted her dive on the pipit. The pipit fluttered out two or three times and each time the merlin attacked again. Eventually another walker went by and the pipit flew off using him as cover. I saw the merlin fly off, apparently with empty talons. We appeared to have saved the pipit but left the merlin hungry. 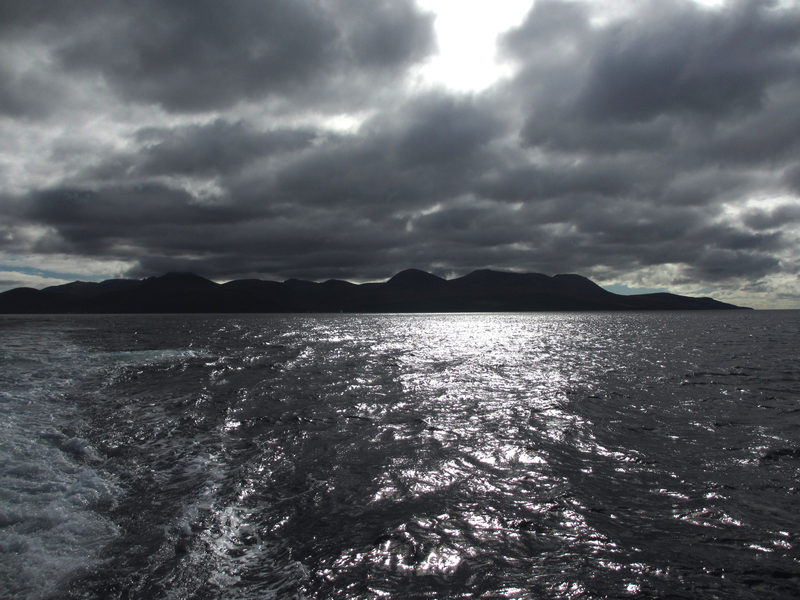 The following morning we left Arran with heavy hearts. The filming was successful, though, and I’ll post a link to the video as soon as it is available!